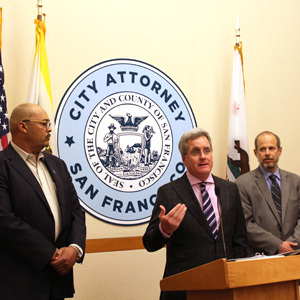 SF Public Works Director Mohammed Nuru, City Attorney Dennis Herrera and SFMTA Director Ed Reiskin at a press conference earlier today. SAN FRANCISCO (May 24, 2018) — Today, City Attorney Dennis Herrera, the San Francisco Municipal Transportation Agency (SFMTA) and San Francisco Public Works announced the city’s next steps in regulating shared, powered scooters in San Francisco. Under city law unanimously passed by the Board of Supervisors on April 24, 2018 and signed by Mayor Mark Farrell, any company operating shared, powered scooters in San Francisco must have a permit from the SFMTA to park their scooters on sidewalks or other public spaces. In compliance with this new law, which takes effect on June 4, any scooter company operating in the city, including Lime, Spin and Bird, is required to remove its scooters from city sidewalks by June 4. The SFMTA today made a permit application available at www.sfmta.com for companies interested in offering shared, powered scooters in San Francisco. Applications for the SFMTA’s new “Powered Scooter Share Permit Program” are due by 5 p.m. PT on June 7. The SFMTA will review the applications and expects to determine which, if any, companies qualify for a permit by the end of June. In tandem with the new permitting system, the SFMTA has established a 12-month pilot program to collect data, evaluate and assess whether further increases in scooters would serve the public interest. As part of the pilot, up to five qualified companies could be issued permits to operate shared, powered scooters in San Francisco. To be considered, they must submit complete applications demonstrating a commitment and capability to meet all permit requirements. For the first six months of the pilot, a total of 1,250 scooters may be permitted. If the first six months are successful, the total number of scooters may increase to 2,500 in months seven through 12. The cap is sufficient to allow for a thorough evaluation of the scooter sharing operating model in San Francisco, while minimizing the potential for sidewalk crowding and safety impacts during the pilot phase. This cap is also generally consistent with the number of scooters the city believes are currently operating in San Francisco. Any shared, powered scooter found on city streets or sidewalks after June 4 without a permit will be subject to impounding by San Francisco Public Works and operators will be fined $100 per scooter per day by the SFMTA in addition to all other applicable city fees and penalties. Further, any company violating the law by operating a shared, powered scooter system without a permit will be denied a permit from the SFMTA.